If this post comes across as offensive, arrogant or downright nasty to anyone, I apologise in advance; I literally woke up on the wrong side of bed and pulled a shoulder, so I’m cranky; plus this matter has been on my mind for several months now. 1. I am not their agent or your fixer; I will not pass on their personal contact info and I cannot pressure them into answering your calls or emails, into attending your events or endorsing your projects. I have included below a list of artists with their Facebook profiles; that way you can contact them directly and they will choose to add you and answer you if they please. If their name is not on the list, I can’t help you get in touch with them. 2. I am not a graffiti expert or authority. This is a blog, meaning i’m writing from a biased perspective. I do not represent or speak on behalf or take responsibility for anyone. If you choose to cite my opinion as a fact, that’s your decision, not mine. 3. It’s been fifteen months since the revolution. Find a new angle other than revolutionary graffiti/street art in Cairo. Even better, go outside of Cairo and explore the scenes in other governates. There have been countless articles published over the past year on the subject, so a fresh perspective would be great. 4. Please do not ask me to write your assignment/article/research paper for you. 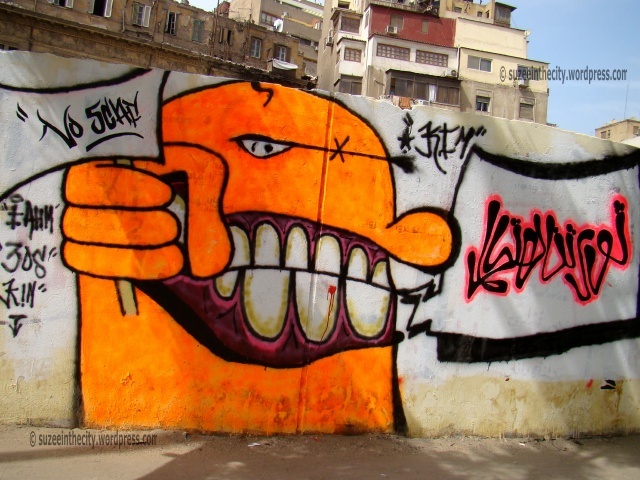 Cairo graffiti is extensively documented, and if you read all the online material out there, including articles and video footage, you’ll have a concise perspective on the subject. If you want me to do your research for you, pay me. 5. If you want to publish my photos and you’re a website I will give them to you for free in return for link-backs. If you’re a print edition, I will sell them to you. It’s that simple. Just because I’m not a professional photographer and living in a third-world country doesn’t mean I’m not aware that photographs are bought and sold and that newspapers and magazines have adequate budgets to afford them. I could tell you a few stories about which publications did what, but I’ll keep my mouth shut. However, in the case of a major publication that refused to buy my photographs, then lied to the freelance reporter who wrote an excellent piece about international street art, telling him they couldn’t find hi-res photos, thus not publishing his piece at all – I’d like to say: ekhs, etfou. 6. Please note that all, if not most of my images are watermarked, sometimes with a subtle white watermark. If you reproduce them without my consent, I will get in touch with you and pursue legal action. If you’re a graffiti artist and you would like your contacts to be added to this list, please leave your comment and I will update it. This entry was posted in Street Art Fascination and tagged Alaa Awad, Alexandria, Ammar Abo Bakr, Amr Nazeer, Aya Tarek, Cairo, Egypt Street Art, Ganzeer, graffiti artists contact, Graffiti the streets of Egypt, Hanaa El Degham, Hend Kheera, Kareem Gouda, keizer, Mad Graffiti Weekend, Mia Groendahl, Mohamed El Moshir, revolution graffiti, Zeftawi. Bookmark the permalink. Good for you! I couldn’t agree more. where’s my tag in this link.. ?! Chase your bad mood !!! Pschittt ! Soeurs Egyptiennes, tenez bon, ne vous laissez pas faire par ces rustres maléfiques, défendez-vous contre ces lâches qui osent s’attaquer à une femme, alors que le prophète Mohammad (saws) a dit et répété, durant toute sa vie : Le meilleur d’entre les hommes est celui qui s’occupera bien de sa femme !